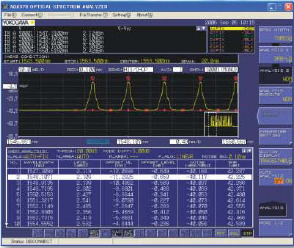 The AQ6370 Viewer is a package of PC application software for PC-based analysis and measurement with the AQ6370 series Optical Spectrum Analyzer. Applicable for AQ6370, AQ6370B/C/D, AQ6373, AQ6373B, AQ6374, AQ6375, AQ6375B and AQ6376. When reading waveforms, files can be quickly selected from the Thumbnail File Preview. Waveforms can be saved as graphic files on a PC. whose formats are .WV*/.TXT, can be used. The displayable wavelength range is 600-1700 nm, which is the measurable wavelength range of Optical Spectrum Analyzer AQ6370 and AQ6370B/C/D. Analysis results can be saved to a PC. 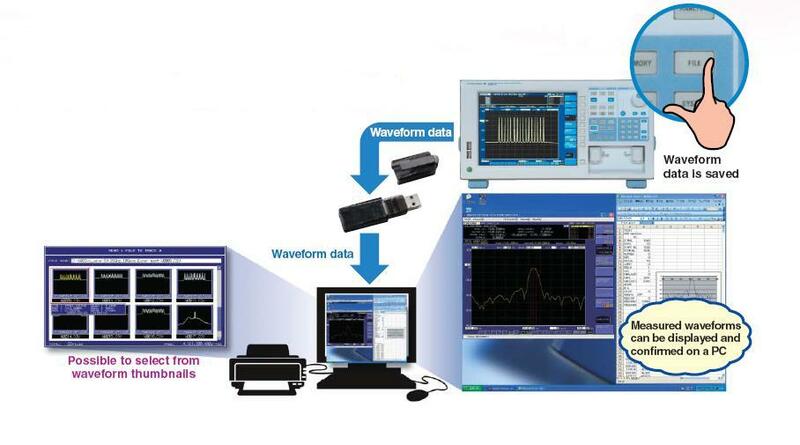 Real-time acquisition and display of measured waveforms using AQ6370 series' remote control with Ethernet LAN. Acquired measurement data can be stored in or analyzed on a PC. Enhancing manufacturing quality through trouble analysis of manufacturing lines and the monitoring of long-term tests. Files saved in the internal memory of AQ6370 series can be transferred to a PC. Programs edited using AQ6370 Viewer can be transferred to AQ6370 series. Caution - For the correct and safe use of this product, please read the instruction manual carefully.